Haida Gwaii. Totem poles and sea mist shroud the west coast islands of Canada. Rain is occasionally heavy enough to drown a duck. (30 cm a day is possible.) Or maybe the ducks drown in the tsunamis – earthquakes give the place a good stern shaking every few years with 8.1 (1949) and 7.8 (2012) as recent examples. Stepping off the west coast of the islands could also get a duck wet – it is a 3,000 metre drop-off into something resembling the abyss. No gradual shelf here. 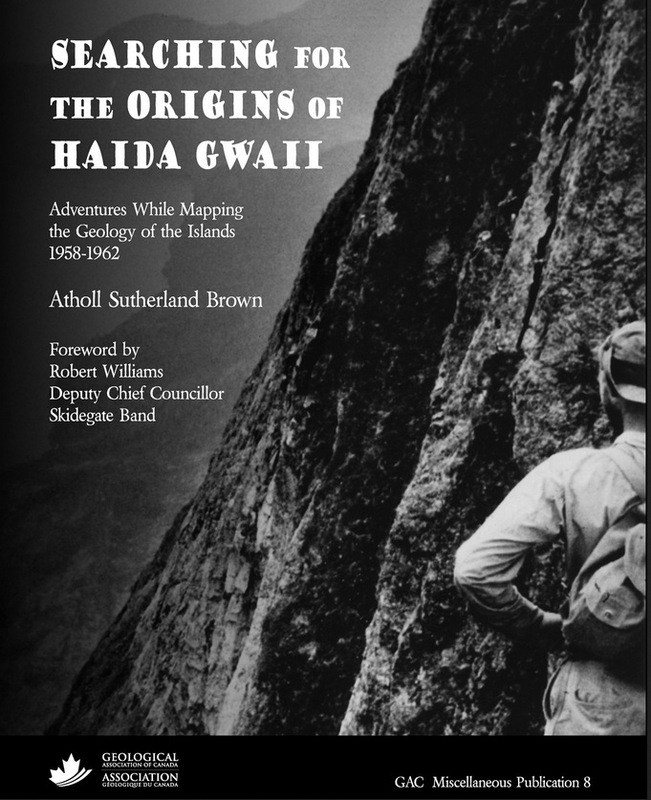 Searching for the Origins of Haida Gwaii by Atholl Sutherland Brown (published by the Geological Association of Canada and available through their website for $40) is partly Brown’s memoir of the years he spent mapping and chiseling rocks among the 150 islands (Haida Gwaii was formerly called the Queen Charlotte Islands) and partly a geology book. The islands’ rugged terrain, gold deposits, and its perch along the transform fault zone separating the world’s largest plate (the Pacific) from North America make it an appealing place to start a geology career. The fascinating remote islands caught the attention of Harry Hess, the scientist who promoted the seafloor spreading theory in 1962 (and largely sparked the plate tectonics revolution). In the mid-1950s, Hess suggested that his doctorate student (author Atholl Brown) head back to his native British Columbia and make sense of the largely unknown islands. And that’s what Brown did. He spent 1958 through 1962 searching for the origins of Haida Gwaii. According to the publishers, the book met the approval of the Deputy Chief Councillor for the Haida Nation, which probably means it is sensitive to the traditions and history of the native residents of the islands. The publisher also adds that Brown’s book tells the story of the islands’ geology through the unique perspective of a pioneering geologist 50 years ago. If you like perusing the history of geology’s erstwhile geologists, you may find this book a good read. It helps to have a bit of a handle on geology, but that’s not a prerequisite. This entry was posted in Book Review, Exploration, History, Oceans and tagged books, Canada, Haida Gwaii, Harry Hess. Bookmark the permalink.